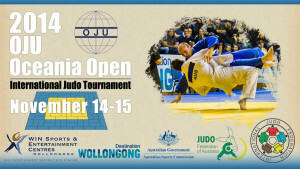 The 2014 Oceania Open Judo event was held at Wollongong’s WIN Sports & Entertainment Center on November 14th and continued to the 15th. This brought elite male and female Judoka from 4 different continents to NSW in Australia to compete in their respective weight classes. It was an exciting international judo tournament, nothing this big has happened since the 2000 Olympics held in Sydney. To visit the 2014 OJU gallery and purchase images, CLICK HERE.